I’m sure I’ve said it before but I’ll say it again…I love Cookie Butter. Since I don’t eat peanut butter it’s a great alternative to put in my baked goods. It is the same color and a similar consistency as peanut butter. 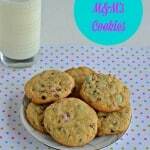 However, it’s very sweet so when I use it in my baked goods I often cut the amount of sugar in the recipe. So where can you get Cookie Butter? My favorite cookie butter is the one that I buy at Trader Joe’s. It has the best flavor and consistency. I don’t have a Trader Joe’s anywhere near me though, so I don’t often get to buy it. Thankfully there is an alternative called Biscoff that I can buy at my local Walmart. Either one of them works great in this recipe. 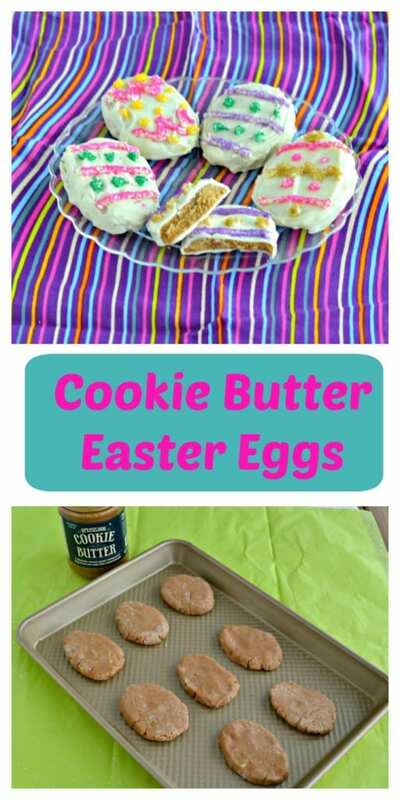 The recipe I found was actually for Nutella Cream eggs but I changed it up to make my Cookie Butter Easter Eggs instead. It’s easy to make these with just butter, cookie butter, and marshmallow cream. That’s all you need to make the Cookie Butter filling for inside your egg! Next I needed to pick a chocolate to coat the cookie butter filling with. I had milk chocolate and white chocolate in my refrigerator but I also had pastel colored candy melts which would have worked well too. I chose the white chocolate because I thought it would look the nicest with the colored candy melts decorating it. After I dipped the cookie butter into the white chocolate I heated several colors of candy melts. I then made designs on my eggs and sprinkled them with sanding sugar. The resulting eggs were so pretty! Who needs store bought filled chocolate eggs when you can make your own at home? In addition to looking great they tasted amazing! 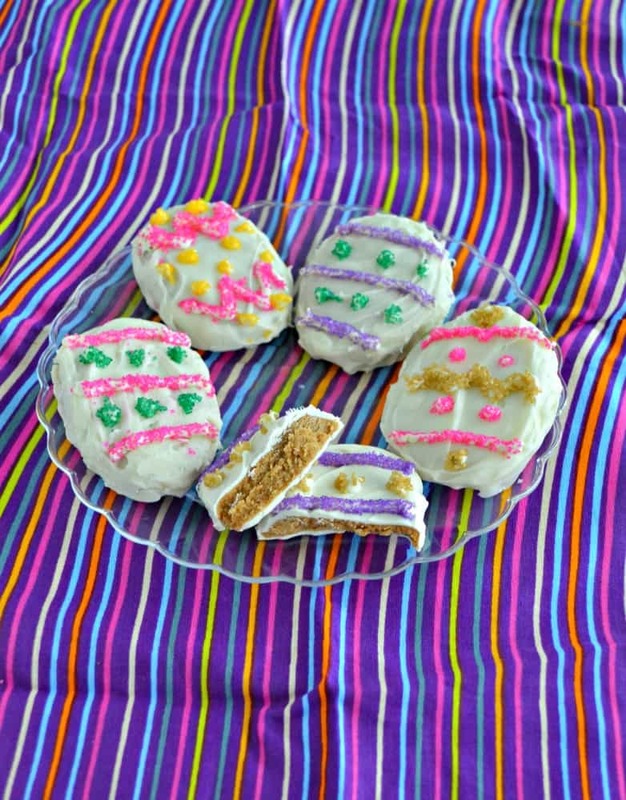 Perfect for an Easter treat or even wrapped up in Easter baskets. 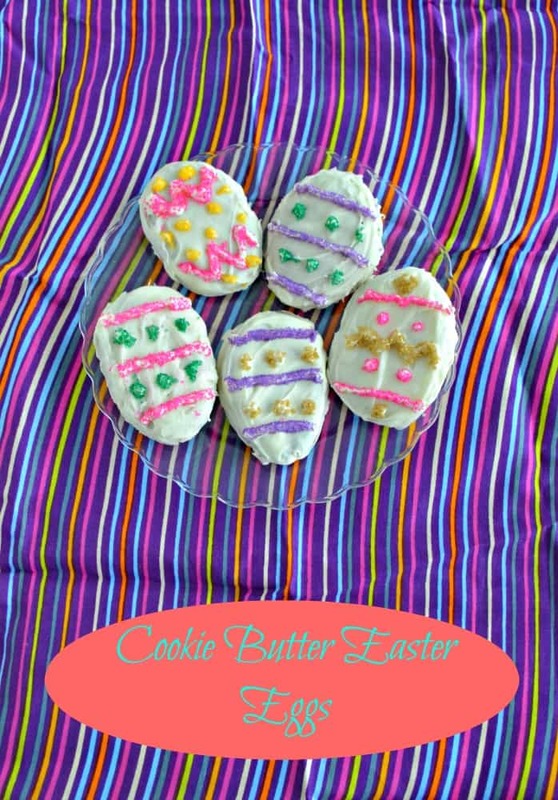 Make your own filled Easter Eggs at home with delicious cookie butter filling and decorated with colored candy melts! 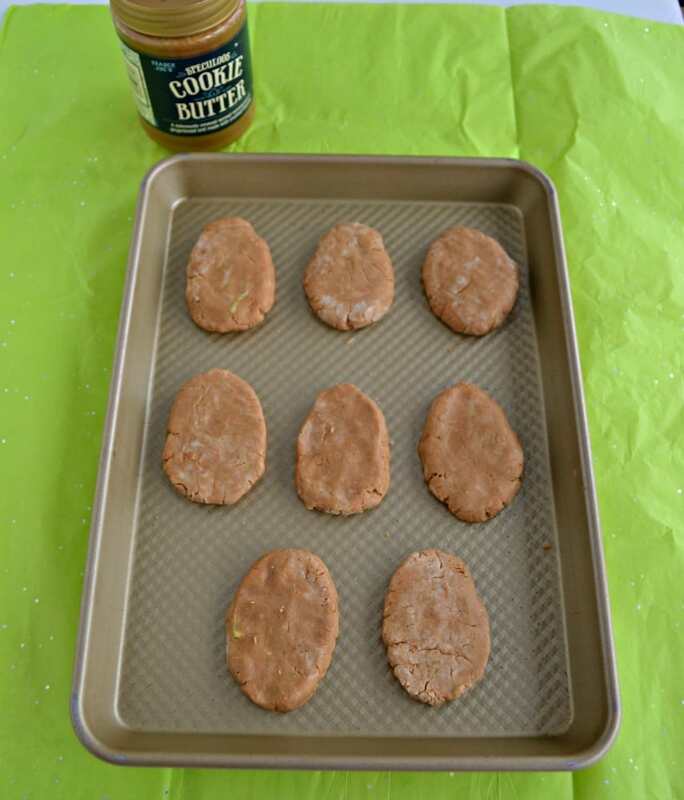 Place the butter and cookie butter in a microwave safe dish and heat for 15 seconds to soften both. Cream the butter and cookie butter together. Add in the marshmallow cream and mix until combined. Slowly add in the powdered sugar a half cup at a time until a soft dough forms. Divide the dough into 12 even balls. Shape the balls into an eggs shape. 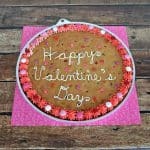 Place on a parchment paper lined baking sheet and freeze for 20-30 minutes. Meanwhile, place the white chocolate and Crisco in a microwave safe dish. Heat on high in 30 second intervals, stirring for 30 seconds in between each heating. Remove the eggs from the freezer. Use a fork to hold the egg and spoon the white chocolate over top. Tap the fork to remove excess chocolate. (I struggled with this step and found it easier to dunk the egg into the bowl, pour chocolate over top, then tap on the side of the bowl). Place the dipped eggs on a baking sheet lined with parchment paper. Allow to set for 15 minutes. 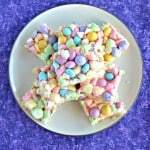 Choose one color of candy melts to work with and melt them according to the package directions. Place the melted candy in a zip top baggie and snip off the end. 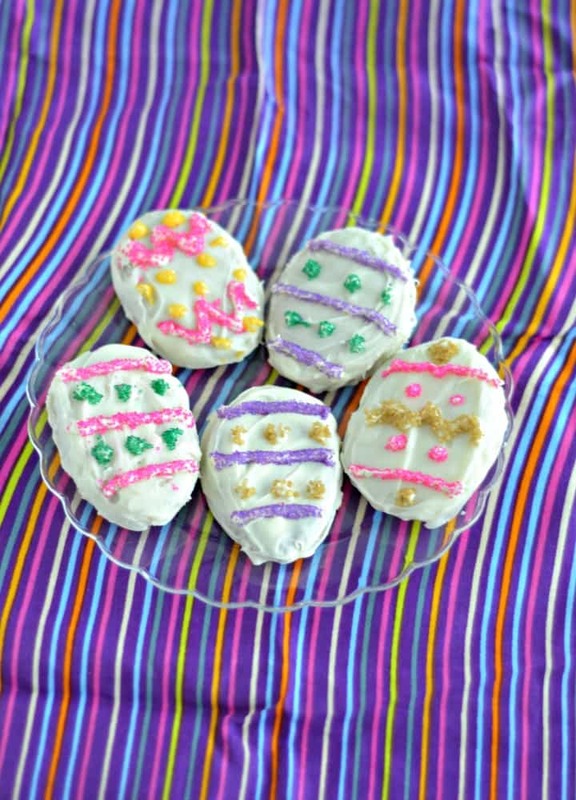 Decorate the eggs with the candy and immediately sprinkle with coordinating sanding sugar if using. Repeat with remaining colors. Allow the eggs to set for 15 minutes then store in an air tight container or wrap individually. I love cookie butter too! Biscoff is actually the original cookie butter. It’s my favorite. These eggs look awesome. Who wouldn’t want to find then in their easter basket? ?? They were way too good. 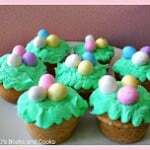 I’m making them again for dessert at Easter but I’m waiting until the last minute so I don’t eat too many!